Though he was born in New York City and rose to stardom in Hollywood as The Fonz on the sitcom “Happy Days,” there’s a part of Henry Winkler that’s always in Montana, a place he has visited on fly fishing trips for years. “I usually say that my heart lives in New York where I was born. My body lives in LA and my soul lives here, in Montana,” he said on Tuesday night at the Radisson Hotel in Billings. In a talk sprinkled with impressions, jokes and nuggets of wisdom from a life that has seen him go from struggling student, to Hollywood star to best-selling children’s author, Winkler delivered a laughter-filled keynote speech at Montana State University Billings’ 2016 Montana Hall of Fame induction ceremony. 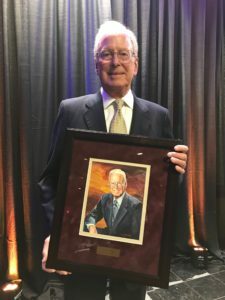 The event, put on by the MSUB College of Business and the MSUB Foundation, recognized three community members for distinguished business careers. 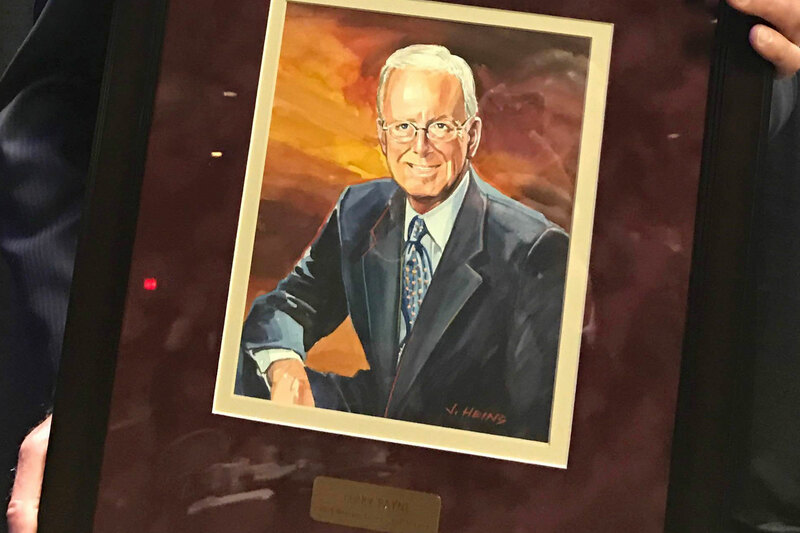 Majority owner and former HKM Engineering President Karen Fagg, Terry Payne & Co. founder and PayneWest Insurance board chairman Terry Payne, and Billings Clinic CEO Dr. Nick Wolter made up the hall of fame’s third class of inductees. MSUB Foundation President and CEO Bill Kennedy estimated attendance for the event to be at around 400. “What we have is a lot of support for MSUB and we see a lot of community leaders out here,” Kennedy said. “It’s an opportunity to come and celebrate leaders that have made a difference in the state of Montana, not just Billings,” said MSUB Chancellor Mark Nook. After taking the stage, Winkler delved quickly into his struggles as a dyslexic student whose career was riddled with academic failures, many of which disappointed his parents. “My life up until this moment was like living in a cylinder of stainless steel, and I tried to climb up to get to the sky, to get to the sun and there were no toeholds and there were no handholds and I kept sliding back and everything was confusing to me,” Winkler said. Winkler said that some of the character’s most famous moments came from his struggles to read the script and willingness to improvise when necessary. Later in life, when encouraged to try writing children’s books, Winkler said doubt began to creep in again. Since then with the help of writing partner Lin Oliver, Winkler has written numerous children’s books following the life of Hank Zipzer, a young boy with learning challenges modeled in part after himself. “His glass is half full, he just spills it everywhere,” Winkler said. Overcoming the negativity came through much deliberation and in some cases reading philosophy, Winkler said. Now he has a strategy.